2.12 Will you see a leopard? 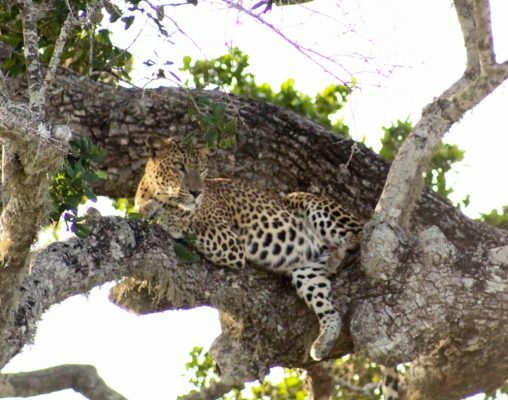 When I was investigating safari companies in near Yala National Park, Sri Lanka, it was apparent Noel Roderigo’s Leopard Safaris is at the top of the list! Unlike my initial safari tours, I investigated in detail, as our prior experiences so disheartened me. As soon as I read about Noel’s and his story I knew we just had to go with them on safari at Yala National Park. Cold towels are my favourite! When you stay at Noel’s camp, every tiny detail has been organised for you. 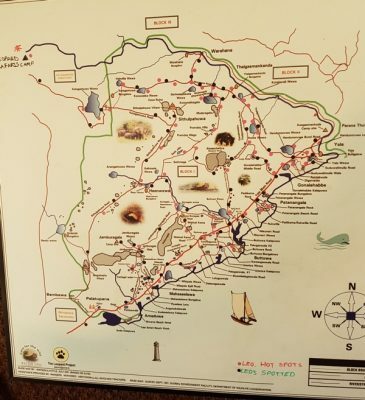 The packages are all-inclusive: meals, drinks including alcoholic beverages, safaris (guide, driver, jeep, government guide, refreshments, and the “foreigner” park fees) plus your accommodation. When you are glamping, you may choose between a standard tent or a deluxe tent. We stayed in the standard tent, specifically the peacock tent. Each tent separate from the next. You feel at one with nature. The camp itself is surrounded by farms on either side and one side it is on the edge of Yala National Park. You feel like you are in the middle of nature. The camp area was so quiet until it wasn’t – read the funny story below. The tents are built along the side of the camp. The middle of the property has the dining areas and my favourite area – the bar and lounge. It was beautiful. We had canapes and wine after our evening safari. It was lit by candles and so romantic. It would be a perfect place to celebrate your honeymoon in Sri Lanka. During our visit, they had just started working on installing a swimming pool. It was made from a shipping container and will be a real asset to the property once completed. Maintaining a low carbon footprint is front and centre at the camp. Everything about Leopard Safaris is well designed and well thought out. Plus, it also looks cool. Wherever possible, items are repurposed or recycled. They use solar power and charge batteries during the safaris whilst driving around the park. The batteries are then used back in the camp. Everything in the camp is ecological and sustainably designed. The environmental policies at Leopard Safaris are nothing short of inspirational. Unlike some resorts or hotels, you will feel zero guilt about staying here. There is a no plastic rule. I loved that they don’t use plastic. It just showed me that Noel walks the talk of ecotourism! I feel sick when I see plastic bottles. On the campgrounds, they have glass bottles, and on game drives, you get a metal bottle. I hope other hotels take note. This is the way of the future. The vast majority of electricity is gained from solar panels and the dual battery system they have installed in their safari jeeps. I do not understand it correctly but when on a game drive the battery gets charged and then that battery is used in the campgrounds. Pretty great, right? 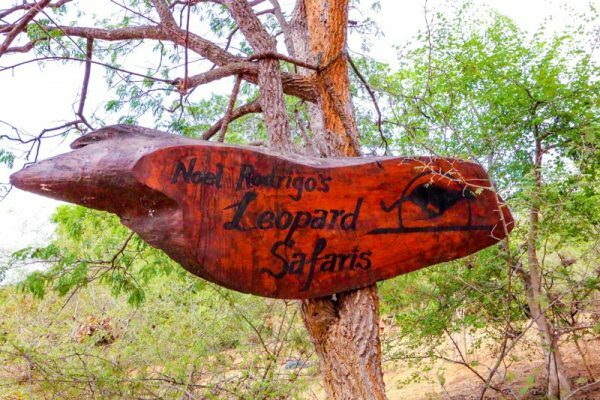 Noel Rodigero’s Leopard Safari walk the talk of “reduce, reuse and recycle”. The utilisation of any waste produced at the camp is commendable. You will drink from pretty jars, and you won’t see a Hipster in sight. They do it to reduce, reuse and recycle! The fences and two bridges on site are made from fallen branches. The torches were charged with main power, no batteries. There was a little sink for hand washing with biodegradable soap. The unique piece of camp equipment for me was the small sink for brushing your teeth. It contained a filter that meant you could spit the toothpaste out and it was converted to a safe by-product that can be put into the environment without any care of its effects. The grey-water was also used in the showers. They had biodegradable toilets. Our son planted a tree at the end of our stay. It was a lovely touch, and we hope to revisit it in the future. It was also a perfect educational starter to talk about the importance of lower our carbon footprints. The camp was without a doubt, the ecologically minded accommodation I’ve ever had the privilege to visit. Noel Roderigo’s Leopard Safari also funds or participates in numerous environmental and community programs. Also before I contacted them about going on safari I had read they were giving out water and other supplies during the 2017 floods. Again, they walk the talk! It is so refreshing to see! There is a large electric fence along the Yala Park boundary that is there to protect the wildlife and humans, alike. When we visited the elephants had other ideas and broke through the fence. The night we stayed was full of adventure although I was packing it in! The local farmers decided to scare the elephants away with thunderous fireworks. It was scary and exhilarating in equal amounts. The use of the fireworks was discussed during dinner, and I hope they can get the farmers not to use these. A safety measure employed by Noel is that each guest is provided with a mobile phone in case of emergency. When the sounds of breaking trees and fireworks got scarily close, we used the mobile to make sure we were safe. I am here to tell the tale, so we were indeed very safe. 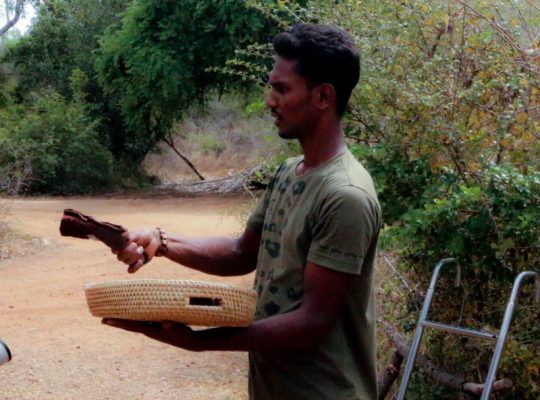 Leopard Safaris employ a dedicated Sri Lankan chef on site. He is a fantastic cook, and the meals we had were some of the best we had during our initial 2.5 months in Sri Lanka. Thoughtfully the chef made a non-spicy version of each curry for our very fussy 8-year-old. He did not eat the food, but it was no reflection on the chef’s ability to cook! Another touch that was great was that after each meal we got an explanation of the ingredients and cooking methods involved in the meals. White bread! The lad was happy! The food prepared was traditional Sri Lankan meals and utterly delicious. Sri Lankans love spice and heat in their diet. If you do not like that or not used to it, like one of the other visitors, it might be wise to mention it when you book. I love hot and spicy food, so I was in heaven. 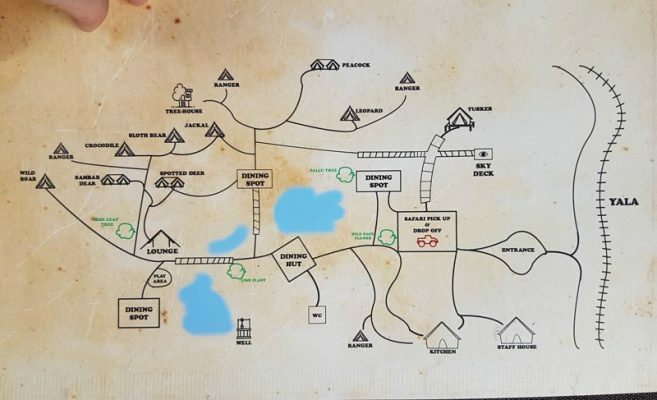 Each meal is set up in a different location around the camp. It is such fun eating in nature. You can see all the stars as you are far from townships and it is beautiful. I did have a couple of visitors from some bugs but they are not harmful. Felt like home – The tents are imported from, made from a heavy canvas and huge! We are from Australia, so we are used to and love camping. Although, usually it is hard work and not the most comfortable. Usually, it involves a very thin air mattress or a swag on the ground. Glamping is so far from that! It is luxurious with the excitement of camping. You have a real bed and mattress. The bonus of having a proper toilet and outside shower (with warm water if you choose) is lovely. If you were visiting in the summer months, I would say the luxury tent would be worth the added expense. We did not visit in the hottest time and had a fan. It was not horrible, but we did feel the heat. There was a portable A/C in the lounge and bar area. Matt opened the A/C unit and brown-coloured snake sprung out at great speed! I only heard the yell of fear but missed all the action! 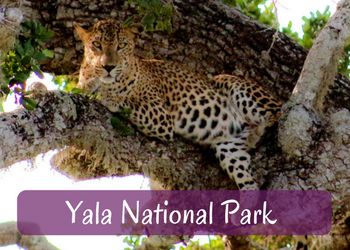 There are 5 blocks at Yala National Park. For both safari drives, we went to Block I. This is the most popular block. 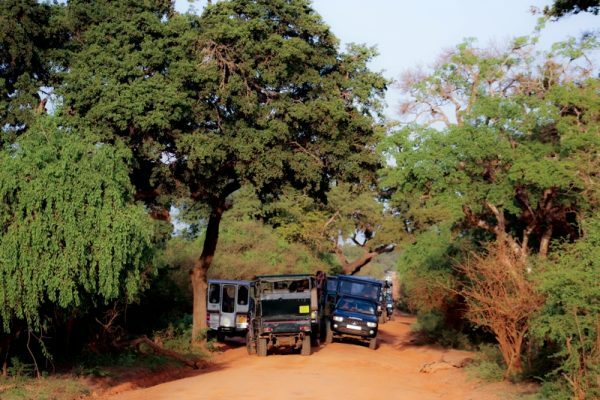 To overcome the sheer number of jeeps at the main gate, Noel Rodrigo’s Leopard Safari enter block I via a lesser known gate called Katagamuwa. The camp is very close to this entrance so you do not have to wake up at 4 am like you do if you stay in Tissa. It was great as there are not hundreds of jeeps in a line like you have at the main entrance – Palatupana. Saamera Gihan was our host, guide and a trained naturalist. He was calm, and his passion for wildlife was palpable. He was not only an excellent safari tour guide, but he was also just a nice person. As the host, he ate with us, and I enjoyed that. We talked about the current elephant situation and the difficulties the wild elephant population face. He had excellent English and well educated about wildlife. I could tell on some of our other safari tours the ‘guides’ would make something up. It was apparently not the case here. Saamera told me he was relatively new to the job. I can only imagine the level of knowledge other guides have given how great he was. Praneeth was the driver, and although we did not interact with him like we did Saamera, it was apparent they work in synch. The drive itself was slow, controlled and so much more pleasant than our other experiences. He was a great driver, and his experience showed. A few times we did stop, and he spoke about specific animals. He also had excellent English, and even over the engine, it was apparent he has the world’s most sensitive ears. He would hear a warning call when it was so faint. He was constantly looking and searching for wildlife. The Leopard Man. The Naturalist. The Environmentalist. The Legend. Noel has been doing this for countless years, and I really would have loved to have met him. By all accounts, he is a brilliant naturalist and amazing at his job. The fact he can leave the camp and it runs so smoothly is a testament to his training, management style and the company itself. 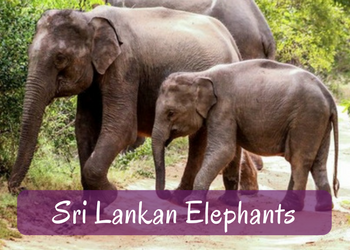 If you want an in-depth analysis of species of animals and birds, you can potentially see on safari in Sri Lanka or Yala National Park safari you will have to wait a little while. I will do an extensive post about this. Basically, on safari, I realised I had previously missed out on so many beautiful species by focusing so much on finding the Sri Lankan Leopards. There are hundreds of other equally impressive mammals, birds and reptiles. Water Buffalo – Most are the domesticated water buffalo. We did see the endangered Wild Water Buffalo (Bubalus arnee). Our highlights were seeing a crocodile climb a tree getting away from a Buffalo. The excitement of hearing the many warning calls and footprints of so many elusive leopards. We saw the prints of a porcupine. We had a couple of really uninterrupted and beautiful time with elephants. 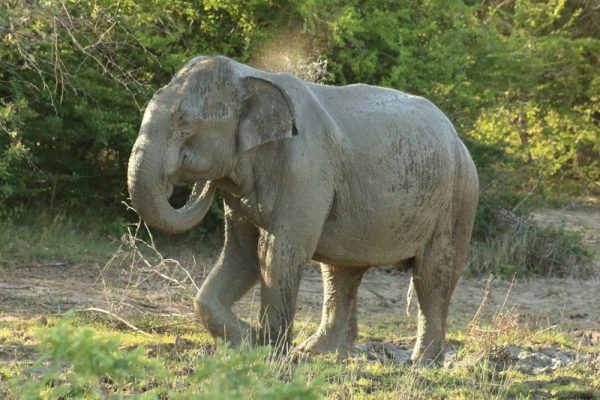 It can be hard to see certain animals at Yala National Park. The Sri Lankan Leopard and Sri Lankan Sloth Bear are the two species that come to mind. We did not see them during our game drives with Leopard Safaris but that was pure luck. We came close many times to see a leopard. High Endangered Sri Lankan Sloth Bear (Melursus ursinus inornatus). Wild numbers may be as low was 500 individuals in Sri Lanka. The normally nocturnal Sri Lankan Sloth Bear (Melursus ursinus inornatus) was on his way to find ripe fruit in Yala National Park. All the staff were terrific. The addition of some X chromosomes would be good for the camp! I would love to see some female guides in this male-dominated industry. The excellent suspension means much nicer game drive whilst on jeep safari in Yala National Park. Not all Jeeps are built the same! The Noel Rodrigo’s Leopard Safari jeeps were very comfortable and well maintained. The vehicles are customised Toyota Land Cruisers. We had six people in our vehicle, and it still felt spacious. More importantly, it felt safe. Prior safaris included more than one drive that scared me due to their driving ‘skills’. The game drives with Noel Roderigo’s Leopard Safaris were not even comparable. The driver was slow and steady. The 4WD also had an ice box filled with glass bottles (so they can be returned), a selection of biscuits and each person had a dedicated water container). You also had access to wildlife field books and binoculars. There is an age limit for children at the camp. 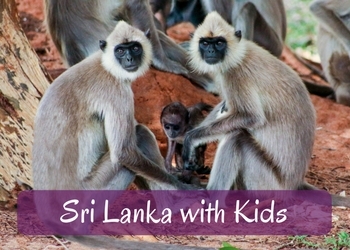 If the kids are older than three years old, they are welcome to stay and go on safari. This rule is very sensible given safaris are long and bumpy. I think the addition of having the option for a babysitter at the camp would be an excellent idea for parents like myself. In the end, we just took our eldest child, although we could have taken the toddler. I knew he would have been bored. I had a wonderful time with only one child, although my baby was less than impressed that I left him for the night. He is still breastfed, so the urgency to feed him after 24-hours away was apparent very fast! The campground is non-smoking. I like that rule, but for smokers, that is something to take into consideration. There are a few rules about being conscious of wildlife and the environment. It is all common sense although if you have never been camping it might not be evident at first. Things like making sure you check your clothes and towels before you use them. I had a very large gecko make my towel his home. Not that they will hurt you, but I would say if you do not like critters – maybe this is not the place for you. The beautiful sunset after our night game drive. Excursion to Sithulpawwa Temple – ancient rock temple dates from 200BC. During all safaris, there was mutual respect for the wildlife. I didn’t feel we were negatively impacting the environment or the animals. Without sounding airy fairy; it was an ethical and evolved experience. 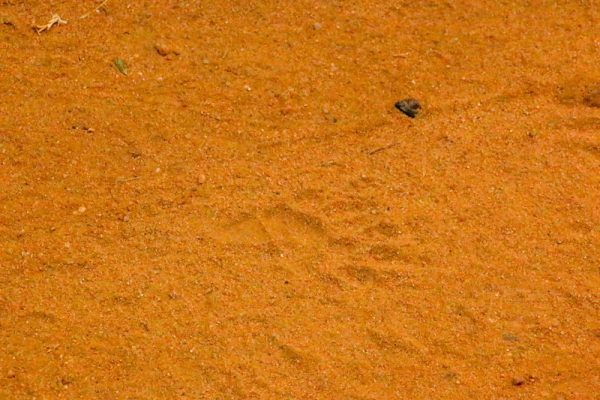 Indian Crested Porcupine (Hystrix indica) Footprint. 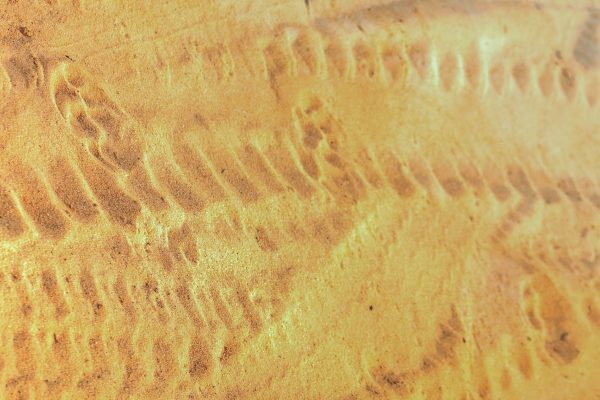 They are nocturnal but even seeing their prints was a highlight. No. Seriously! If I had to say one thing I guess the zips were a little fiddly. Fortunately, there is an alternative to “The Circus”. Our game drives with Noel Roderigos Leopard Safari’s was sensational and calm. I cannot recommend them enough! I will be back and would love to experience glamping at their Wilpattu National Park glamping in the site in the North Western Province. Leopard Safaris is not a budget stay. It is an unforgivingly high end and luxurious accommodation. At first glance, the cost appears high. When you factor in the cost of meals, drinks including alcohol and the high cost of multiple game drive safaris, it is a well worth it. 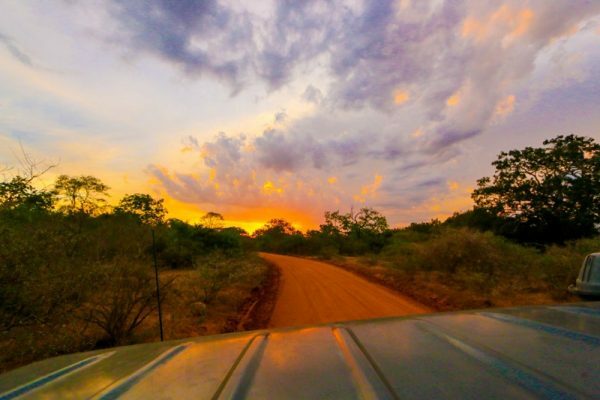 We did a ‘budget jeep safaris at Yala National Park’ and when I factor in the cost of paying all the fees, charges, tips, pay for guide and driver – I was paying $100++USD/drive. Some drives were a complete write-off. I could done 2 with Leopard Safaris and seen 90% of the same animals. I am not including any food or drinks for the day so that was extra. 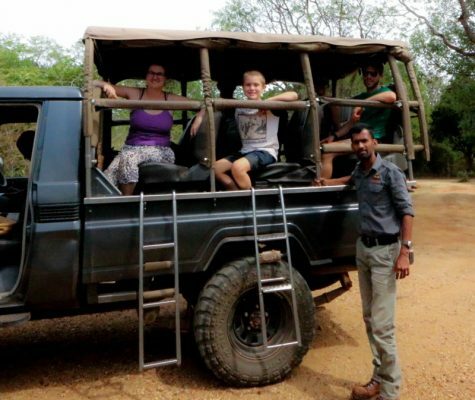 There is so much to know to have a successful jeep safari at Yala National Park. Will you see a leopard? If you have luck on your side. Yes! We were so close to seeing a leopard so many times during our safaris. We heard warning calls a few times. It was so exciting and once you go on one safari. I will warn you! It is addictive. I will be back, and I will be going with Noel’s company again! My only real regret was only choosing the 1-night safari. I think two nights would be perfect. 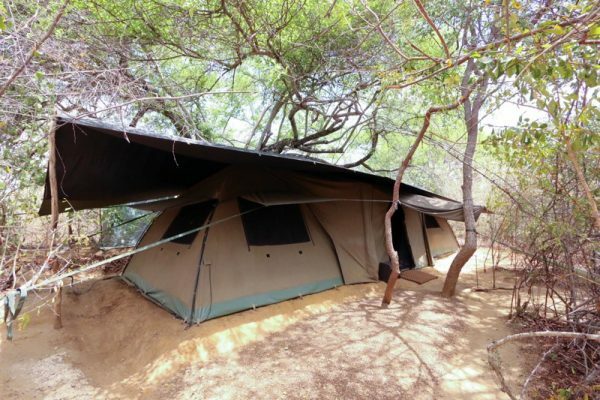 You would get a few extra game drives and a chance to utilise the beautiful glamp ground. You do need to put in the time and effort into seeing wildlife. You need good luck but it is essential to have knowledgeable safari guides. They need to be able to track the footprints. When I compare our experiences, I wasted money on the uneducated hope of running into one – a leopard that is!!! There is so much more to the experience that catching a glimpse of a leopard. It is about subtle clues. A footprint or a warning call. Unfortunately, the majority of safari drivers just speed around waiting for a call to say a leopard has been spotted. Then everyone speeds and crowds the poor leopard. It is horrible and we were involved in this type of unacceptable practice twice. Don’t add to The Circus at Yala National Park. 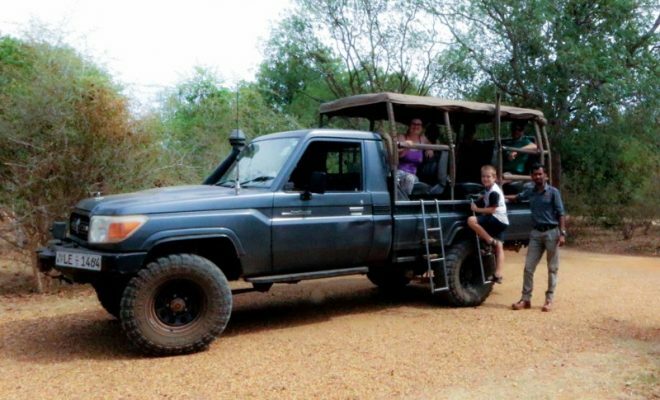 Go with an ethical jeep safari company, like Noel’s Rodrigo’s Leopard Safari! The campground, the glamping and the game drives were epic. I love that I found such a wonderful, ethical and sustainably minded business that I can share with you all. If you want to learn more, please ask me! I am happy to answer any questions you might have.